Like many large cities, downtown Phoenix has its share of large stadiums and event centers. Symphony Hall, the Herberger Theater, the Orpheum Theatre, Comerica Theatre, and of course, Chase Field and Talking Stick Resort Arena, which are home to the Arizona Diamondbacks and Phoenix Suns, respectively. 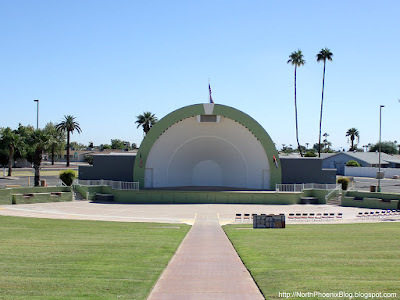 Downtown Phoenix is not the only place in the Valley of the Sun to catch a great concert or performance. As you venture towards West Phoenix and Glendale, there are several big venues including the University of Phoenix Stadium (completed in 2006), Gila River Arena (completed in 2003), and the Ak-Chin Pavilion (opened in 1990). 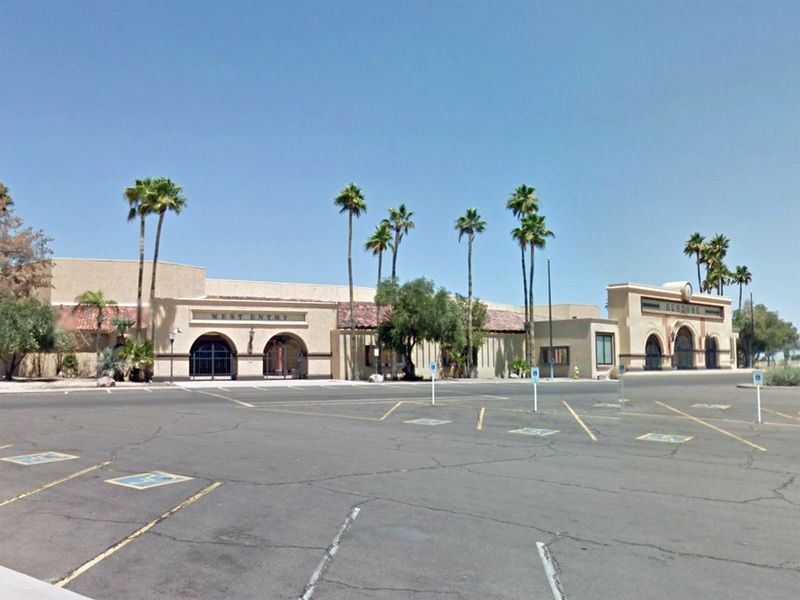 But before all of these new facilities existed, the major entertainment venue of the West Valley was the Sundome in Sun City West, AZ. With a seating capacity of 7,000 people, the Sundome was the premier venue for concerts, musical and theatrical performances, and many other events. The story of the Sundome really begins in 1928 when a carpenter's apprentice from California named Delbert "Del" Webb moved out to Arizona and started his own construction company. 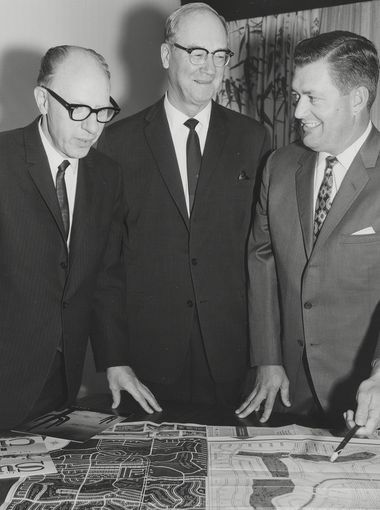 America's involvement in World War II was a catalyst that ignited a building boom in Arizona, and Webb was riding a wave of success with Government contracts. 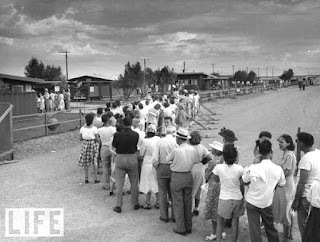 His company built the Poston War Relocation Center near Parker, AZ as well as Thunderbird Field No. 1 (today Thunderbird School of Global Management), Luke Air Force Base, and Pinal Air Park near Tucson, AZ. After the war, the Del E. Webb Company branched out and was the primary contractor for the Flamingo Casino and Sahara Casino in Las Vegas. 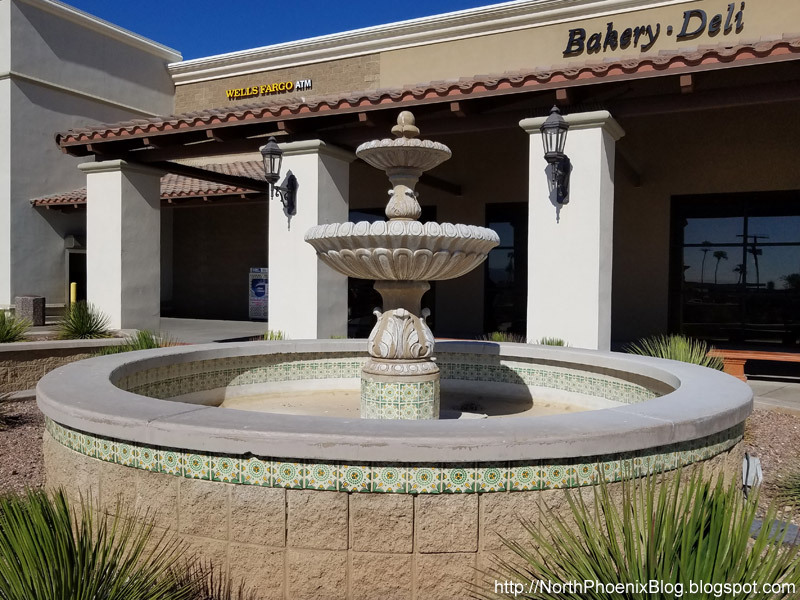 They continued to build heavily throughout Arizona, working on projects such as shopping centers and hospitals. 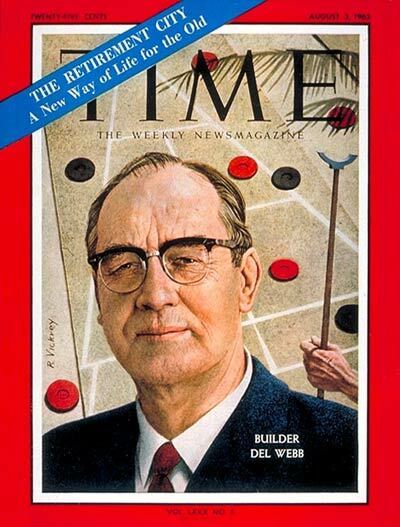 In 1948, Del Webb was awarded a contract that would be a significant turning point for his company. The project was a 700 home development in Tucson called Pueblo Gardens, which included a 100,000 square-foot shopping center called Pueblo Plaza. The homes were constructed simply with wooden frames on concrete foundations, but Webb and project manager A. Quincy Jones found ways to make them unique. A total of six floorplans were designed, but by building the homes at different angles on the lots and varying the setbacks from the street, the neighborhood did not appear to be a "cookie cutter" subdivision. Models included a one-bedroom, one-bath for $4,975, a two-bed, one-bath home for $5,975, and a three-bed, one-bath for $7,975. The $20 million Pueblo Gardens project was a success, with hundreds of families lining up around the block to view the new model homes. Though the project had an option to build out to 3,000 homes, only 750 homes were built in Tucson. Media attention from Life Magazine and Arizona Highways brought national attention to the project, and Webb must have certainly recognized a market opportunity in building master-planned neighborhoods that integrated low-cost homes with schools, parks, and shopping centers. It is likely that Pueblo Gardens was the inspiration for a new retirement community in Arizona. In 1959, Del Webb began constructing the first of what would later become many master-planned retirement communities. The company purchased 20,000 acres of cotton fields and transformed the land into Sun City, an age-restricted development for those age 55 and up who wanted an "active lifestyle" retirement. Sun City opened on January 1, 1960 and received a cover story in Time Magazine. The homes were built using many of the same principles that had made Pueblo Gardens successful, and surrounding them with golf courses, community centers, and recreation facilities. One of the key features of Sun City was the Sun Bowl, an open-air amphitheater for hosting concerts and other public performances. The idea came from John Meeker, who was the president of DEVCO, Del Webb's Development Company. In a 1996 interview with the Del Webb Sun Cities Museum, Meeker recalled that in about 1967 or 1968, he was on an airplane flight and read a Time magazine article about a large housing project in south San Francisco that had built an outdoor amphitheater as a marketing tool. 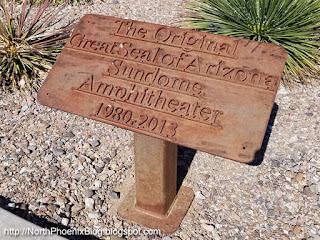 Meeker liked the idea, and it wasn't long until Sun City had its own amphitheater - the Sun Bowl. Residents would bring their own folding chairs to the terraced lawn and watch performances in the wintertime. Meeker recalled that Liberace was the first act to play at the Sun Dome, and Lawrence Welk and many others were booked for residents on a weekly basis. He stated that the Sun Dome worked as a marketing tool, and sales of new homes jumped from 1,100 houses per year to 1,800 houses per year. However, the Sun Bowl was not without its problems. 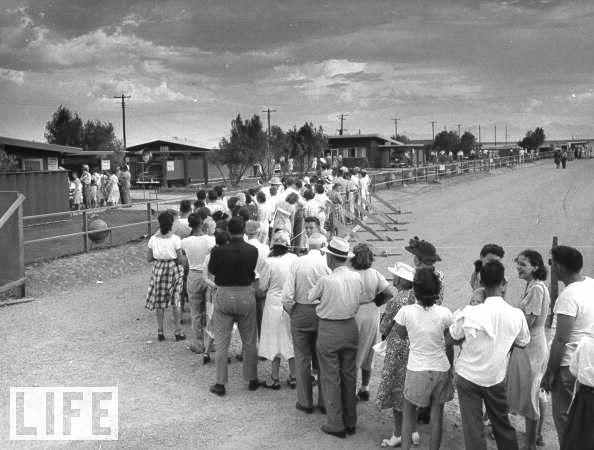 As Meeker stated in the interview, the unpleasant odor of cattle from the nearby Spur Feedlots and the constant flyovers of jet aircraft from Luke Air Force Base were sources of frustration for the residents of Sun City, and affected the enjoyment of these outdoor performances. 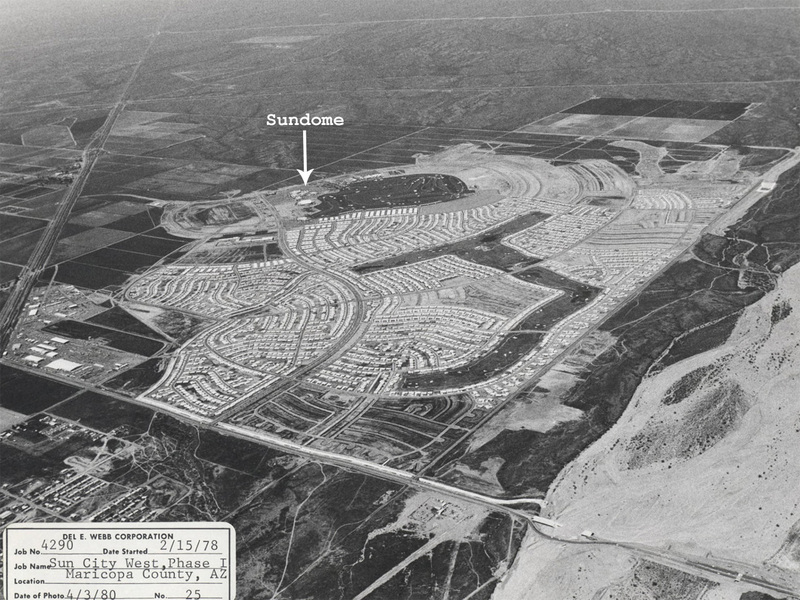 By 1978 Sun City was fully built out, but Webb had no intentions of stopping there. The company began work on a new project 2 miles to the west, appropriately named Sun City West. Like the original development, Sun City West would feature a mix of retail, community, and residential spaces easily accessible to residents. However, the plans for entertainment with Sun City West were scaled up considerably. 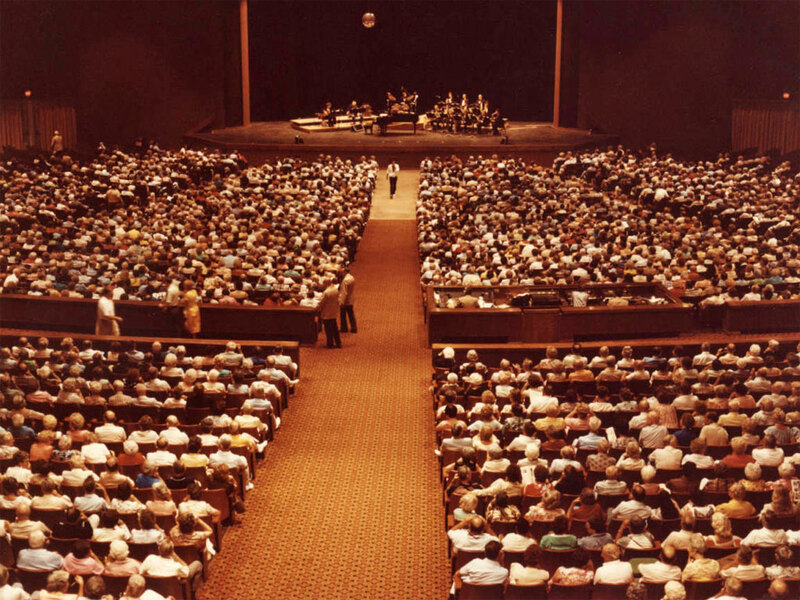 Instead of another outdoor amphitheater, the Del Webb Company wanted to build a large indoor theater to draw larger acts and performances. They had looked into a New York based architect who had built inflated dome structures in Iowa and Florida as a possible low-cost alternative to traditional construction methods. However, Meeker recalls that the interior noise of those structures was "tremendous." Still, the developers liked the idea of the dome-shaped structure, and hence the name Sundome was chosen. The new Sundome was several orders of magnitude larger than the old Sun Bowl. With a roof four stories tall and a seating capacity of 7,000 people, the Sundome would be a major selling point for Sun City West. Construction on the new 108,000 square-foot Sundome began in 1978 and lasted more than a year. Whereas the Sun Bowl cost just over $100,000 to build, the Sundome was constructed at a cost of $8.6 million dollars. 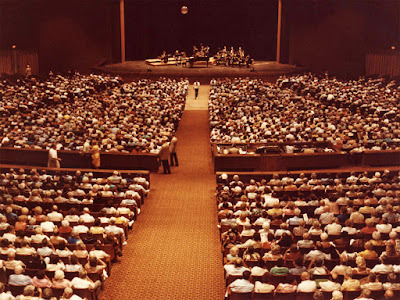 When completed in September of 1980, the Sundome was the largest single-floor theater in the nation. It featured plush, comfortable seats that were usually only found in higher-priced sections of major theaters. Things were off to a great start with Lawrence Welk and his orchestra playing the venue's inaugural show. While the Del Webb Company had built the Sundome, the company had no interest in operating the venue going forward. They noticed that Arizona State University had a proven record of managing Gammage Auditorium, and offered it to ASU for $1. 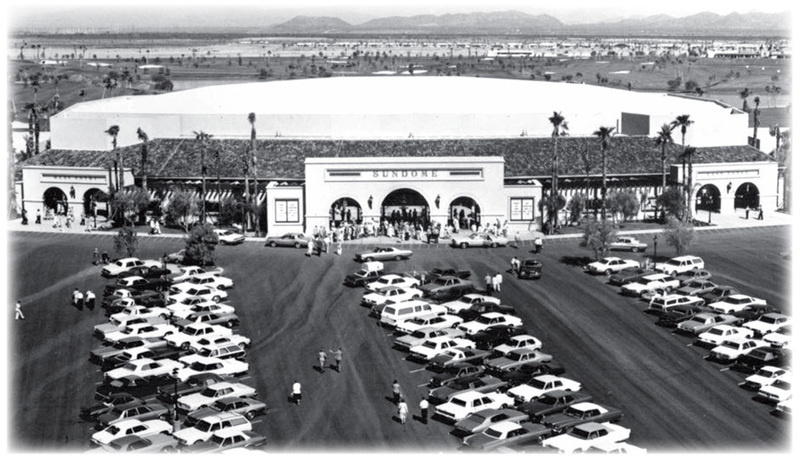 ASU assumed ownership of the Sundome in 1984. At the time, the Sundome was operating with an average annual deficit of $200,000 - meaning the facility was not making any money. Arizona State University operated the Sundome for many years. 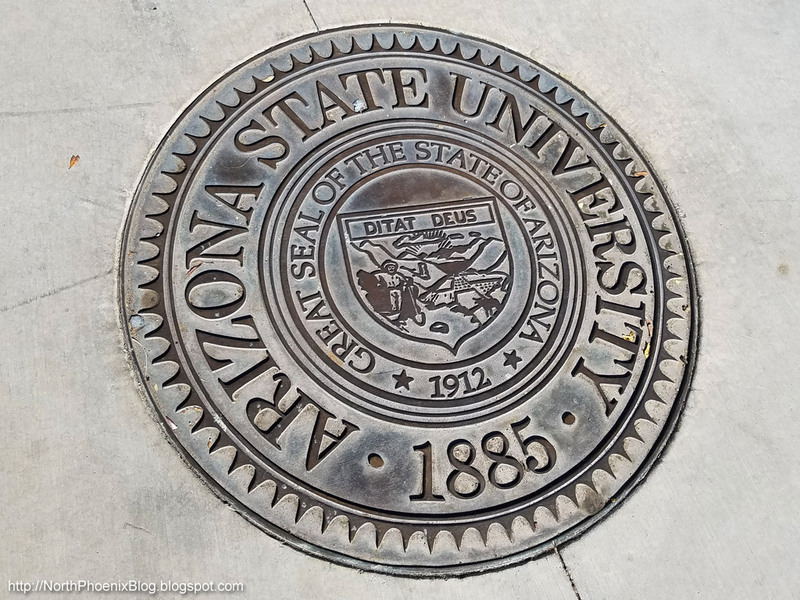 This University Seal is located in the sidewalk on the site of the former Sundome. ASU continued to operate the Sundome for the next decade, during which time the venue hosted acts including Bob Hope, George Burns, Dolly Parton, Johnny Cash, Walter Cronkite, John Denver, Andy Williams, Willie Nelson, Red Skelton, and countless more big names. By 1995, the 15-year old theater was in need of a refit. Upgrades to the stage, dressing rooms, and adding additional restrooms were estimated to cost $5 million dollars. It took almost 4 years to raise the necessary money, but donations and gifts of $5.4 million had been raised by December 1999. According to the Sun Cities Historical Society, professional theater design companies were brought in to review the planned upgrades. Cost estimates quickly spiraled out of control to $20 million dollars. Some of the desired upgrades were cut back, but the lowest bid still clocked in at $13.5 million dollars - far more than the Sundome could afford. The project to refit the theater was officially cancelled. As operating costs continued to outweigh the annual income, ownership of the Sundome was transferred from ASU to Maricopa County and took on the new name of "Maricopa County Events Center." They continued to book shows, but audiences weren't showing up in big numbers like they used to. Many shows were performed with less than half of the seats filled. An annual variety show and high school graduation ceremonies were some of the larger events held at the Sundome during this time. 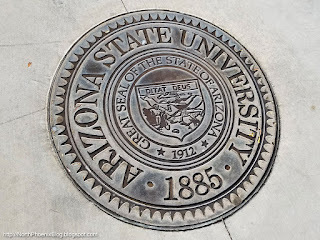 In 2009, ownership was transferred from the County back to Arizona State University. Not long after that, the Sundome closed permanently. The seats and lighting equipment were removed, along with the 75 foot by 6 foot mural from artist Alfred Kabica that hung in the lobby for 29 years. 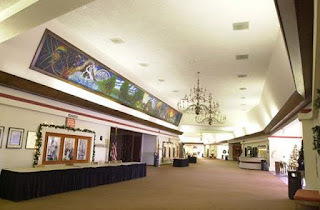 The Lobby area of the Sundome featured a 75 foot-long mural by Alfred Kabica. The Sundome sat there, empty and fenced off until 2012, when Scottsdale-based developer Brown Grace 6 Investments LLC bought the 16-acre site from ASU for $2 million. 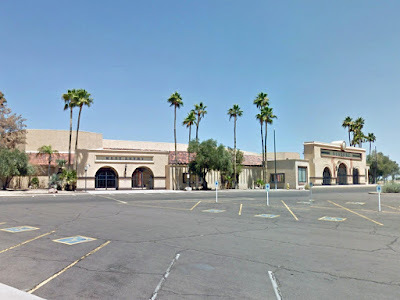 In May of 2013, Maricopa County approved a demolition permit for the facility. By June, local news stations reported that the Sundome would be replaced by a 94,113 square foot Fry's Grocery Store. Demolition of the Sundome commenced in August 2013 and was completed by September. The site was cleared and construction on the new grocery store and shopping center was underway. When the new Fry's Grocery Store opened on August 29, 2014, residents who fondly remembered the Sundome were delighted to see that the new structure incorporated elements of the Sundome into the design. The decorative iron gates from the Sundome were saved and were added to the exterior walls as design elements. The original light fixtures could not be saved, but replica ones were created for the front of the store. Mosaic tile adorns the entryway, as it did with the original building. 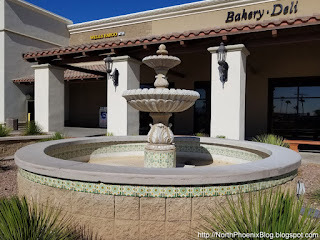 A smaller scale replica of the original fountain was also built near the store's entrance. The new Fry's store preserved the arched gates and mosaic tile pattern from the original stadium. The lighting fixtures are replicas. 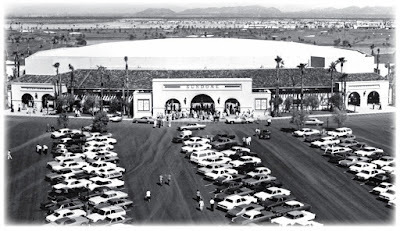 Throughout its 33 year history, the Sundome was one of the most iconic and memorable venues of Phoenix's West Valley. Though its history was a turbulent one, it was a source of entertainment and community events for nearly three decades. While it is sad that the Sundome could not be saved, there is some consolation that the memory of this place is not lost forever. Personally, I am very pleased that Fry's recognized the importance of the Sundome to Sun City West and its history and I appreciate the lengths they went to incorporate details of the former structure into the new grocery store.